Leftover risotto is transformed into a hearty appetizer with the help of some Mexican spices and pantry items. 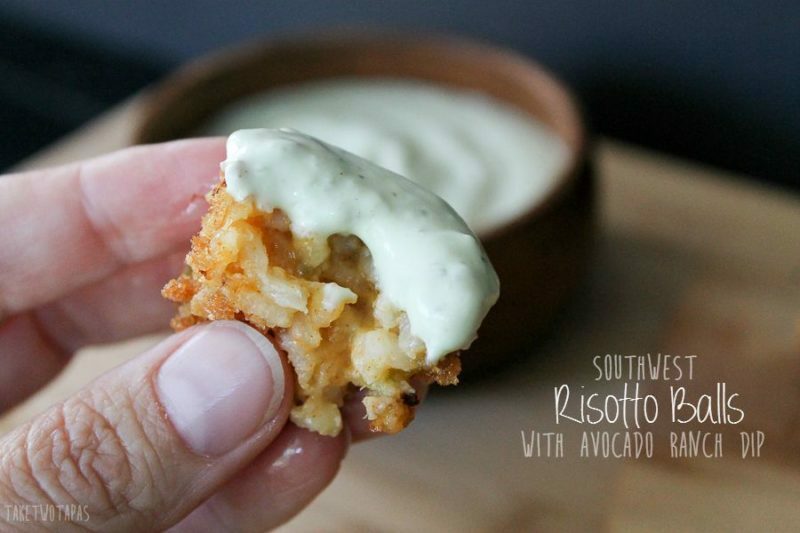 Southwest Risotto Balls and Avocado Ranch Dip are perfect for a fiesta! My family loves Mexican recipes but one thing that we are not a fan of are leftovers. Brooks will only eat two things that are leftover from previous meals: pizza and ham. I made risotto the other night and, as usual, I made too much so I needed to find a way to use the leftover risotto and make it into a new dish that even Brooks will eat. 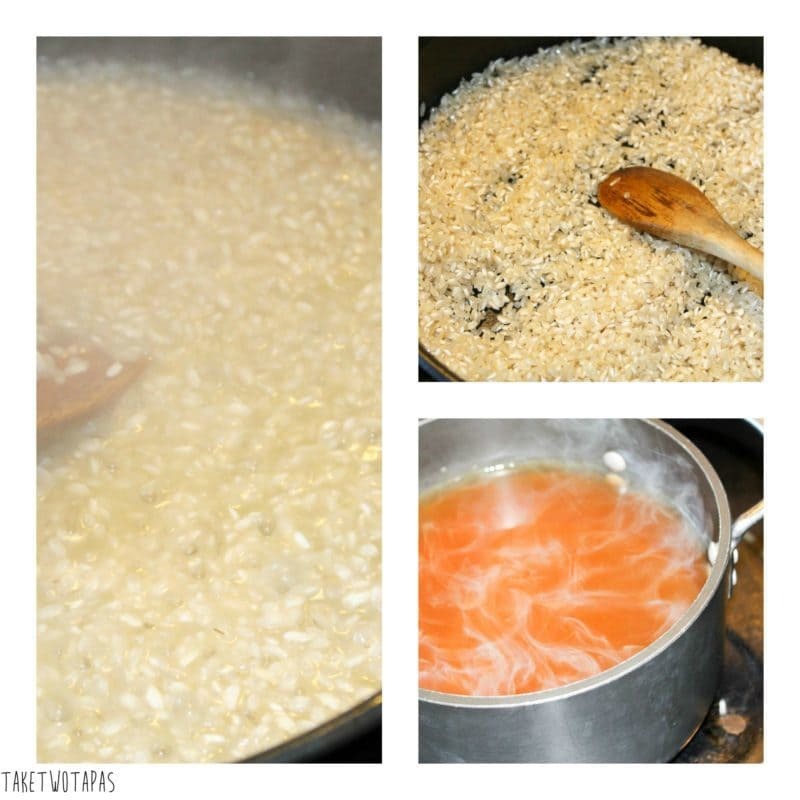 If you are not familiar with risotto, here is a quick note about it. Risotto is a rice dish that comes from North Italy that consists of starchy, short-grain rice called Arborio rice that is slow cooked with a broth or other flavorful liquid. I use a lot of white wine when I make risotto but you can use chicken or vegetable broth. When I made it the other day, I used vegetable broth and a little bit of butter because I wanted to keep it simple since the kids were eating it too. I used 2 cups of Arborio rice and toasted the rice in a saucepan with 1 tablespoon of butter. Once the rice was toasted, I slowly added warm broth, 1 cup at a time, until all 6 cups were used and the rice was creamy and cooked through. This made 6 cups of rice and we were left with 2 cups once we were done eating. I put it in the refrigerator for later knowing I could turn it into something great. When I was ready to repurpose the risotto, I grabbed my the rest of my provisions! These risotto balls also required a few other ingredients that I already had on hand as well: sour cream, ranch seasoning (homemade but you can use the packaged one to save time), shredded cheese, panko breadcrumbs, and an egg. Time to clean out the fridge and make a summer fiesta! I hate when I get home and my avocados are all bruised and over-ripe. The easiest way to find a good one (or two or three) is by looking at the stem. Grab one with the stem attached. It should be firm but tender when you gently squeeze. Pop the stem off. The avocado “belly button” should be green, not brown. If it’s brown, it is past it’s prime and you should put it back. Store leftover avocados in an air-tight environment. The air is what turns your pretty green to a yucky brown/gray. I store my ripe ones, that I can’t use right away, in my vacuum sealer and place in my freezer. They stay perfect for a few months and ready for smoothies or guacamole. You can also make your guacamole and then store in the vacuum bags too. If you are storing in a food storage container, cover the top with plastic film directly on the guacamole to keep the air out. Time to make the risotto balls! This recipe is simple! Grab all the ingredients and combine, minus the Panko breadcrumbs. 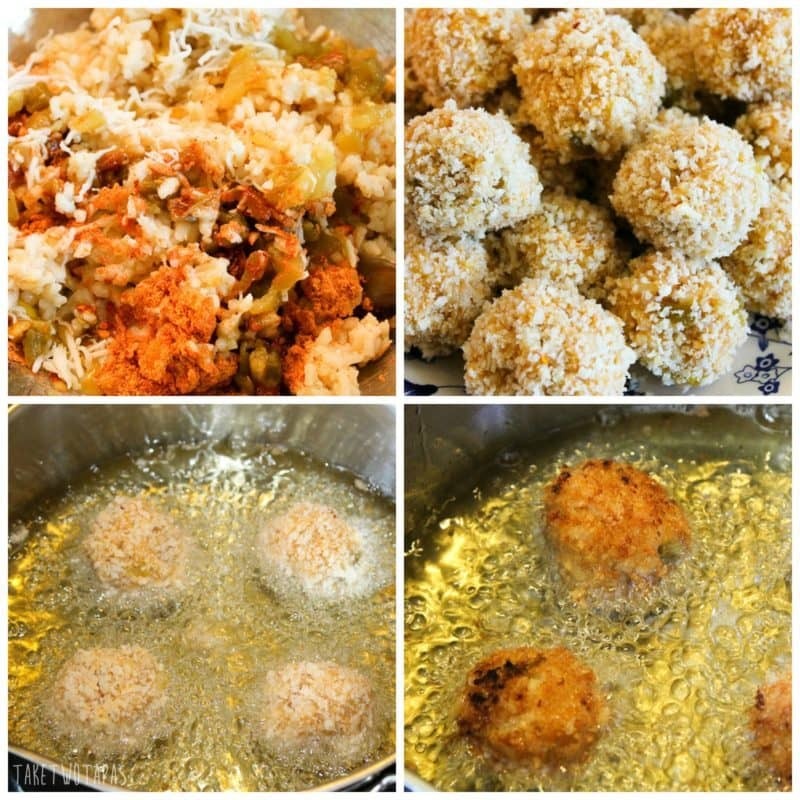 Roll into 1 inch balls, then roll in the breadcrumbs to coat, and fry in 375F oil until brown and crispy! Drain and serve with Avocado Ranch Dip. 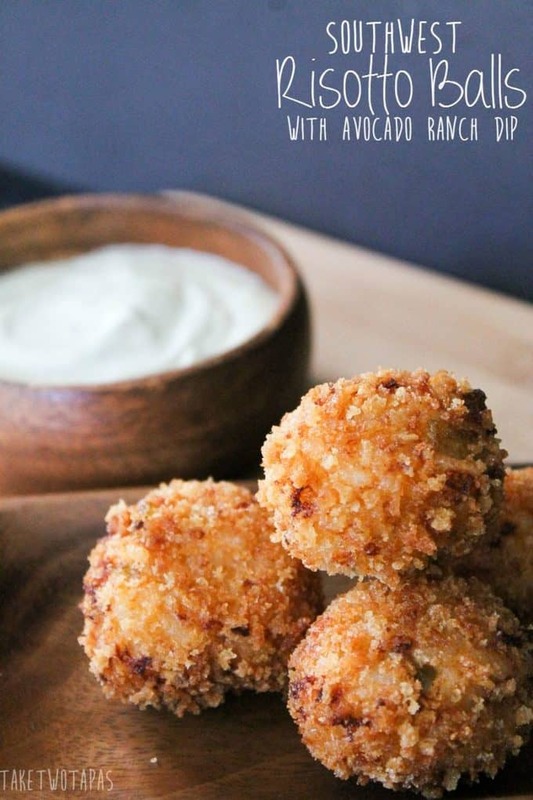 These Southwest Risotto Balls are the perfect way to use up leftover risotto or rice, are a great meal with a salad, and make the perfect party appetizer! My Avocado Ranch Dip is the perfect sidekick! 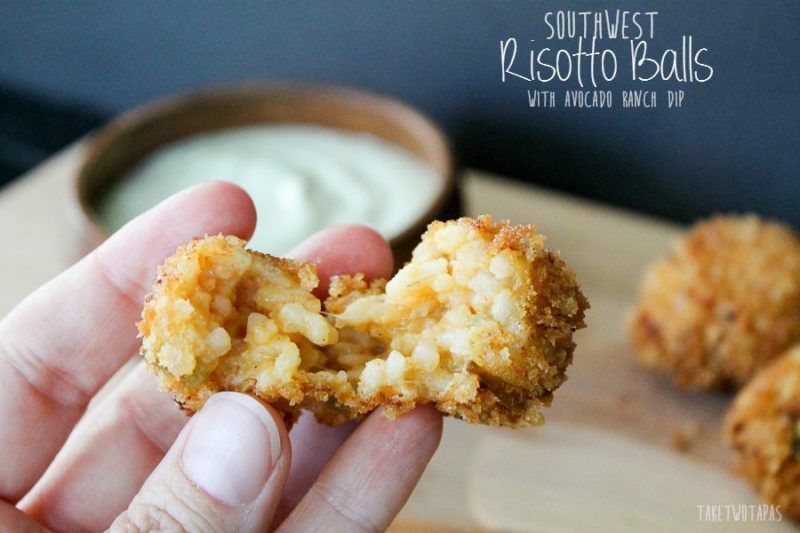 Repurpose some leftovers into these Southwest Risotto Balls and keep your Summer Fiesta going into the next day or two! Combine, leftover risotto, egg, taco seasoning, chilies, and cheese. Form into 1 inch balls. I used a small ice cream scoop. Fry 4 or 5 at a time until golden brown, flipping once. Remove and drain on a cooling rack or paper towel-lined plate. 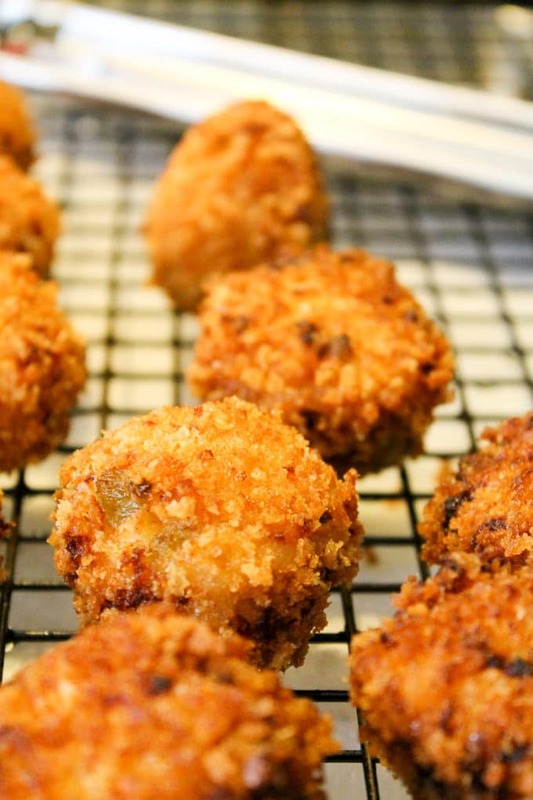 Keep warm in the oven while you fry the rest. 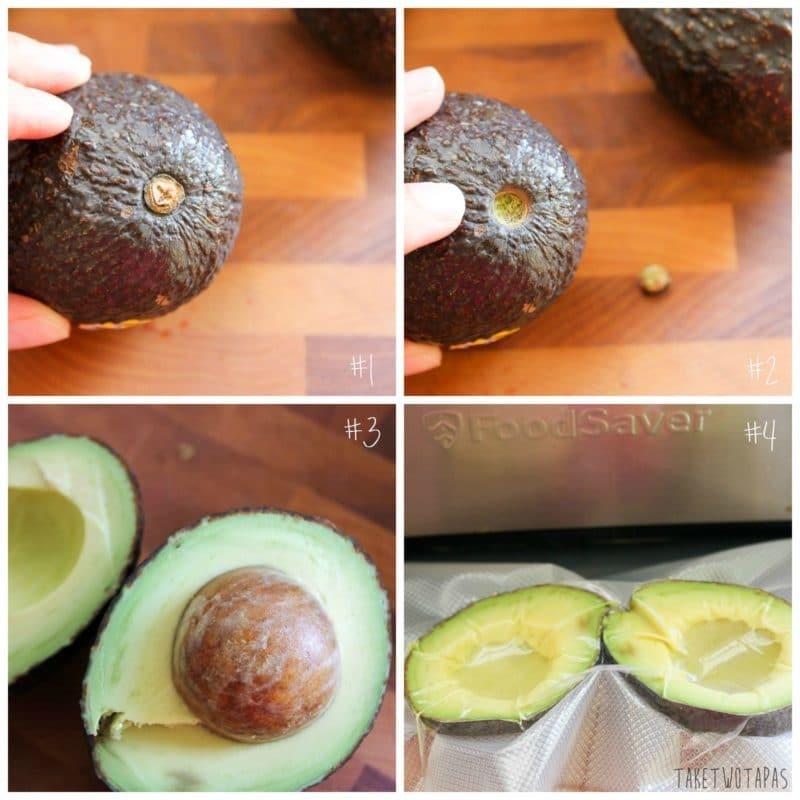 Peel avocado and remove seed. Add avocado, sour cream, lemon juice, ranch seasoning, and pepper to a blender or food processor. These look FANTASTIC Jennifer !! I want to try this! 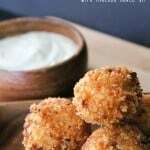 I love risotto balls, and you know I love anything Mexican! I have the same loves so I couldn’t resist combining the two! I love this! I make an Italian version of this and it’s awesome. I’m soooo excited to try this!! I would love if you would come link up at tonight’s Throw Back Thursday!! Done and Done! I eat the Italian ones all the time and love them! Thought I would throw a new twist to it! Thanks Monique for stopping by and reading! Great way to use leftover risotto, but I never have leftover risotto, so I’d have to make a fresh batch…I have a slight addition to risotto. I love the Mexican flavor twist. I usually don’t have any leftover either but I made a double batch to use up the rest of my rice:) I am addicted too:) No judgement! This little snack looks so awesome! I love the fusion between the Italian classic dish and the very Mexican/Tex-Mex flavor profile. I love seeing your posts on #TryaBiteTuesday – always so fun and yummy! Thanks again for stopping by and hope to see you next week too! Off now to promote your recipe. 😀 Have a fabulous day!! Thanks so much! I love some SM promotion! 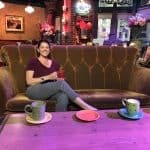 Thanks again for a great link party! These look amazing. I love the cheese in them and that dipping sauce – yum. Thanks so much! I ate way too many of these this weekend!